Almost all of the working individuals plan to settle down into a peaceful and comfortable retirement. However, these plans often do not account the factors that will dramatically change the scenario once the retirement sets in. For instance, the pay cheque, health and medical facilities would no longer be provided by the employer. Rather expenses right from day-to-day needs to health care would soar at a steep rate, leaving one incapable to carry on with his/her existing lifestyle. So, here are the three simple steps that could let you achieve your retirement goal with ease. Measure your needs and save: Evaluate your needs in those sunset years and then save accordingly. A survey shows that most of the individuals save just 5% of their income towards this goal. However, a common thumb rule is to allocate savings toward retirement that could fund nearly 80% to 90% of the total current expenses. This amount should not include other investment goals like a child's education or marriage goals. During retirement, expenses will skew more towards insurance, health and medical care, while other costs like entertainment and maintenance expenses would come down. Power of saving early: The earlier you save, the more money will be accumulated. This works on the compounding factor as savings for a longer period will earn the equivalent compounding advantage. Thus, Rs. 2,000 saved today will fetch more returns at the time of retirement, than Rs. 3,000 saved 10 years later. Obviously, time too holds value, which should be unlocked at the earliest. It is proved that a three years delay could mean 7% lower returns to the portfolio. Calculate longevity: A retirement corpus should ideally last till the lifetime of the last survivor. So, its prudent to buy an annuity plan. 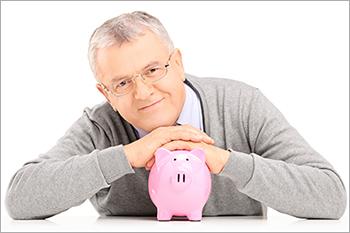 It offers the convenience to choose to receive your retirement funds paid to you in a lump sum or in monthly, quarterly or yearly installments for the rest of your life. However, the years and size of annuity depends on the invested corpus and the opted time period.